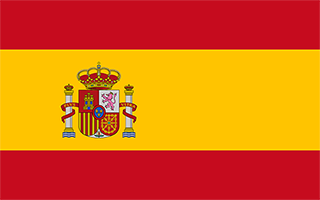 Spain with its capital Madrid is located in Europe (Southwestern Europe, bordering the Mediterranean Sea). It covers some 505,371 square kilometers (almost five times the size of Kentucky) with a population of 48,958,200. Spanish, Catalan, Galician, Basque and Occitan are the languages spoken by people in Spain (consider regional differences). Andorra, France, Gibraltar, Morocco and Portugal are bordering countries. Spain is a diverse country sharing the Iberian Peninsula with Portugal at the western end of the Mediterranean Sea. It is the country with the second-largest number of UNESCO World Heritage Sites, after Italy, and the largest number of World Heritage Cities.Spain is considered an exotic country in Europe due to its friendly inhabitants, relaxed lifestyle, its cuisine, vibrant nightlife, and world-famous folklore and festivities. Among many places worth visiting are Spain's thriving capital Madrid, the vibrant coastal city of Barcelona, the famous Running of the Bulls at Pamplona, major Andalusian cities with Islamic architecture, like Seville, Granada and Córdoba, the Way of St. James and the idyllic Balearic and Canary Islands. To reach someone Spain dial +34 prior to a number. The local cellular networks are operated on 900 MHz, 1800 MHz, 3G, 4G. Websites typically end with the top level domain ".es". If you want to bring electric appliances (e.g. battery chaarger), keep in min the local 230 V - 50 Hz (plugs: C, F). The sign for the locally used currency Euro is EUR. Three horizontal bands of red (top), yellow (double width), and red with the national coat of arms on the hoist side of the yellow band; the coat of arms is quartered to display the emblems of the traditional kingdoms of Spain (clockwise from upper left, Castile, Leon, Navarre, and Aragon) while Granada is represented by the stylized pomegranate at the bottom of the shield; the arms are framed by two columns representing the Pillars of Hercules, which are the two promontories (Gibraltar and Ceuta) on either side of the eastern end of the Strait of Gibraltar; the red scroll across the two columns bears the imperial motto of "Plus Ultra" (further beyond) referring to Spanish lands beyond Europe; the triband arrangement with the center stripe twice the width of the outer dates to the 18th century. Spain's powerful world empire of the 16th and 17th centuries ultimately yielded command of the seas to England. Subsequent failure to embrace the mercantile and industrial revolutions caused the country to fall behind Britain, France, and Germany in economic and political power. Spain remained neutral in World War I and II but suffered through a devastating civil war (1936-39). A peaceful transition to democracy following the death of dictator Francisco FRANCO in 1975, and rapid economic modernization (Spain joined the EU in 1986) gave Spain a dynamic and rapidly growing economy and made it a global champion of freedom and human rights. More recently Spain has emerged from a severe economic recession that began in mid-2008, posting three straight years of GDP growth above the EU average. Unemployment has fallen, but remains high especially among youth. Spain is the Eurozone’s fourth largest economy.